Step 1: Luminous and Sun-kissed skin - Most looks that Rita Ora sports screams the 'sun-kissed glowing from within' thing that most Brits, well, don't have and many of us mortals die to re-create. Rita has been noted to use Shimmer Brick compact in Bronze by Bobbi Brown for giving her highlighted skin. She also uses it as a an eye shadow and blusher. You can achieve her glow that rivals pregnant women by using Nars Illuminator in Copacabana. Step 2: Luscious Black Liner - I practically envy Rita's liner. It's always so dark, thick and lovely and frames her brown eyes nicely. Go for a waterproof liner in black that boasts stay power, such as Stila's stay all day waterproof liquid eye liner. Keep the eye shadow neutral to compliment the statement liner and lips. Step 3: Fire red engine lips- And finally to top off her look, stand out red lips. 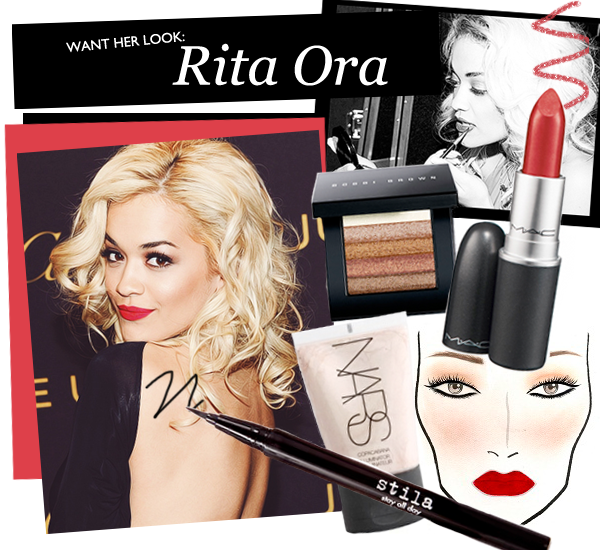 Rita usually wears varying shades of red or berry lippy but her weapon of choice is usually MAC Ruby Woo or Lady Danger. I also adore her red lips, but who doesn't love a good red lip.